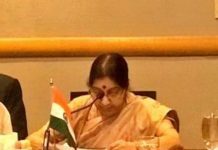 Prime Minister Narendra Modi on Friday held bilateral meetings with presidents of Argentina and Angola on the sidelines of the BRICS Summit. 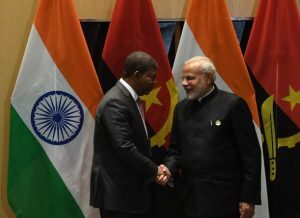 Ministry of External Affairs Spokesperson Raveesh Kumar said Bilateral meetings continue for PM Narendra Modi in Johannesburg With the President of Angola Joao Lourenco. “Discussed intensifying relations in trade and investment, agriculture & food processing, pharma, oil and natural gas,” Raveesh Kumar tweeted. The Prime Minister’s Office said Modi held a separate bilateral meeting with Argentine President Mauricio Macri. “Accelerating ties with Argentina. 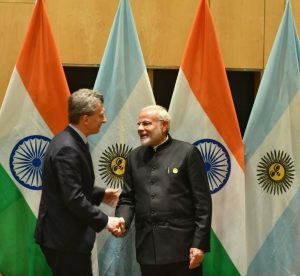 During their meeting, President @mauriciomacri and PM @narendramodi talked about strengthening relations especially in the areas of agriculture, pharmaceuticals, and investment (sic),” the PMO tweeted. Argentina will soon host the annual G20 Summit in 2018.